The wild, yet friendly bottlenose dolphin, we affectionately named Buddy. Last January, I wrote a story about how and why I became a vegan. Putting myself out there in my blogs is nothing new for me, but that story was different. In the end, it wasn’t about me. It was about the choices we make and the impact they have on others. At the time I wrote my veggie blog, I was coming up on my five year life altering anniversary – the one where I left my 20 year corporate career so I could spend my days surrounded by nature with my critters in our rural community, and so that I could experience new challenges and to stretch outside the same job I had for half my lifetime. As my anniversary approached, I was feeling it was time for another stretch. I started asking myself, what next? What did I want to invest my time in, and what could my latest and greatest enterprise be? As a habitual planner, I wanted desperately to strategize and chart my next steps. But for all the fish in the ocean, I couldn’t figure out WHAT it was I should be planning. It reminded me of five years ago how I didn’t have it all figured out. That my WHY was so clear and strong, I was able to take a leap of faith and move forward. It was time to get clear on my WHY again. Did I still want to spend time in nature? Was freedom still important to me? Did I still want to experience new challenges? Hell ya, but I also had one or two more things to add to the list that stretched beyond my own internal little wants and desires. So I wrote out an intention. I have shared this with very few people, so hear it goes…. I put my lofty intention out to the universe. I meditated on it. I journaled and made vision boards. I even googled it. And I waited. I waited for something to show up in my life where I could put my passions and skills to work to help preserve our planet or at least my little corner of the world. My mentors told me to be patient and to wait for “the signs”. Not one to take a hint, I politely asked the universe to send me clues that I couldn’t possible miss. And then she sent me a dolphin. Sign #1. My husband and I were on our winter adventure sailing through the Bahamas when we spotted a lone dolphin on our starboard. I couldn’t get in the water fast enough to meet my new friend. I knew I would be lucky to get a few fleeting moments with this amazing creature. After a breathtaking 45 minutes of swimming, interacting, being so close I could give him a kiss on the cheek, I said goodbye to “Buddy” and made a promise to him that I would find a way to help protect him and the other sea creatures I came to admire through our travels. When I returned home from that trip, I kept reminders of Buddy around me. A video of him stayed on my desktop and a dolphin birthday card from my friend who shared the experience with me is still proudly displayed on my desk. Buddy was actually my third wild dolphin encounter in recent years, although none as intimate, and he wasn’t going to be my last. I spent the rest of the winter and spring plugging away at my consulting work and enjoying my hikes with my Muddy Paws clients. As warmer weather approached, I started organizing my life so I could spend the majority of the summer at our cottage. I moved horses, rescheduled dog hikes, and limited consulting work so I could optimize our time in, on or near the waters of the Northumberland Strait. We settled into summer cottage life with ease – Riding my horse at a nearby stable in the mornings, and afternoons on the Strait boating, swimming, waterskiing and paddle boarding – a dream come true for this water bug. But something was rattling inside of me. I was unsettled and lying in bed at night I was feeling anxious. An unnerving feeling that I was taking way more than I was giving. Sign #2. One Friday morning we woke up to sunny skies, no wind and flat water. Perfect weather for a cruise over to Pictou Island to enjoy their pristine beaches. The warm air breezed by me as I sat on the bow and looked out over the horizon. Out of the corner of my eye I saw a dark fin. I asked my husband to cut the engine and as we floated we found ourselves surrounded by a pod of porpoises (an equally smart and adorable close relative to the dolphin) breaching as they enjoyed their mackerel lunch. This time I exercised control and admired them from inside the boat. Sign #3. As we made our way to Pictou Island I was feeling an enormous sense of gratitude for having had another experience with these intelligent creatures. Once anchored, we waded into shore. I could make out a large foreign object on the beach and as we got closer, I saw it was a lobster trap entangled in a mountain of fish netting that was buried deep in the sand. I started digging. No way was this net getting anywhere near those porpoises. I had visions of a fierce winter storm and pounding waves pulling the net out of the sand and into the Strait where it would be of danger to marine life. The net was massive, but I kept digging hell bent on making this one small contribution to protect our environment. As I dug, my husband saw how futile my good intention was and continued walking down the beach. A few minutes later he returned to inform me there was at least another dozen even bigger net enmeshed lobster traps scattered across the shoreline. I stood up and walked down the beach with him observing a grave yard of old fishing lines, traps and nets. As we turned around to make our way back, I spotted a massive piece of white plastic partially buried below the wet sand, shallow water lapping over it. The plastic had a logo clearly exposed – Irving. The dolphins, the traps, the nets, and the black & white message written in the sand – The universe was laying a trail of things to come. I spent the rest of the summer enjoying everything Pictou County had to offer – riding on the beach, trips to the farmers market, and time on the water. I made a few attempts to contact the right people to get the lobster traps and nets removed from Pictou Island with no luck that I know of. Mother nature would have her way with them and I would have to pray that winter showed some mercy and they would be where we left them next summer. My intention still intact, I still wasn’t clear on how it would manifest. I knew I wanted to protect the ocean but didn’t know how to put my skills to use. I was having a hard time envisioning how I would fit into the world of environmentalists, scientists, activists and lobbyists who were the catalysts of all environmental good doings. I dropped out of grade 12 biology, didn’t have the stomach for politics and kept my head in the sand when it came to current events – as far as I was concerned, the news was just a big downer. Sign #5 (Sign #4 comes later) As summer came to a close and getting back to reality was on the horizon, I received notice that both of my long-term consulting clients were being acquired by larger companies on the exact same day. Holy mother of panic. While I had wished for more time to spend on important matters like saving dolphins, I was having a hard time letting go of the steady stream of income that landed in my mailbox each month. So the universe did it for me. In one fell swoop, she freed me of the ties that kept me from fulfilling my intention. I now had the time to invest in what mattered most to me. No excuses. No distractions. Sign #6 While I may have avoided traditional news like the dried up jellyfish on our cottage’s beach, I did spend a few minutes perusing Facebook most days. It was there that I saw a petition against Northern Pulp’s proposed effluent pipe into the Northumberland Strait. Northern Pulp sits at the opposite end of Pictou Harbour from our cottage. For years, the community has been subjected to the mill’s air pollution and the destruction of Boat Harbour – a once pristine tidal bay used by First Nations people for fishing and recreation, now a settling pod for toxic effluent. When we pass the mill in our boat, I close my eyes, hold my breath and imagine a marine research centre in its place. When we have lunch on the Pictou waterfront, I sit with my back to it so it doesn’t ruin an otherwise serene Nova Scotia coastal view. And when the smell of its smog gets so bad you can’t breathe, we retreat to safer coast lines beyond the stench. Like most Pictounians, the mill would often come up in our conversations. We would criticize them for their shoddy environmental practices and blame our local politicians for not doing a better job of protecting us from this goliath. Then we’d move on to other pressing matters like what colour to paint our fixer-upper of a cottage. I signed the petition, but knew I needed to help in a bigger way. There was an active group in Pictou County advocating for clean air with a local singer/song writer leading the charge. Back Track to Sign #4. We had made one more trip to Pictou Island last summer. We got wind that Dave Gunning, was performing a fundraising concert on the island. Last minute, we booked a room at the island’s only bed and breakfast and ventured over on our boat with storm clouds chasing behind us. I had only heard one of Dave’s songs in the past and with front row seats, we were in for the highlight of our summer. As Dave sang and told funny tales, he also shared lyrics about the devastation of our province’s natural resources and the misguided well-being of his community. As he launched into “Preaching to the Choir”, I knew the song would become an anthem for me as it was for others living in Pictou County. After signing the petition against Northern Pulp’s proposed effluent pipe, I found myself reaching out to Dave to see if I could help with his group. I shared my professional experience with him, that I recently came into some free time, and was ready to get to work. Dave suggested I would be a good fit for a newly formed community group – Friends of The Northumberland Strait. The name of the group alone had me hooked. Friends of the Northumberland Strait had their first meeting on November 20th. Fisherman, fisherwives, business owners, concerned citizens, professionals, experienced advocates, and cottage owners like us met to discuss what we could do to stop Northern Pulp’s proposed plan to dump 90 million litres of toxic effluent daily into the Northumberland Strait. In the first month our group has pushed municipal councils to pass resolutions in favour of a more thorough environmental assessment; helped plant over five hundred “No Pulp Waste in Our Water signs” throughout Pictou County and beyond; distributed factual hand-outs on the impact of the pipe; stood with our fisherman and Pictou Landing Fist Nations at Northern Pulp’s public consultation meetings; created a platform to share facts, science and opinions on the consequences the pipe could have to our economy, our environment, our health and our quality of life throughout Atlantic Canada; and started a #nopipe trend that spread through social media engaging support, conversation and opinions. It was an intense month where I could put my creativity, strategic planning skills and love for collaboration to work. My long-time mentor has asked me a number of times over the years what is that “thing” I would get out of bed every morning to do for free. I could never answer that question with certainty until now. The last two months, I have bounced out of bed with an intense purpose I have never felt before. The fact that I’m getting a sense of purpose from Northern Pulp’s latest threat on the environment isn’t lost on me. That while I work along side fisher families who are trying to save their livelihoods, I’m getting fulfillment and a sense of joy out of the collaboration and working towards a purpose that is so meaningful. I am optimistic that this pipe will not be going into the Northumberland Strait. And that hopefully no pipe means no more pollution of any kind from Northern Pulp. That Pictou County can finally grow to its full potential where its natural resources are cherished and celebrated. I’m hoping to be part of that transformation – to being part of a community that is aligned with my own values. It is clear to me as the waters of the Northumberland Strait. Have you ever written an intention for your life? Have you ever gotten so clear on WHAT your heart desires and WHY, that you’ve witnessed the universe conspiring to help you succeed? Trust me. It happens! My long-time mentor, Stephanie Allen, is sharing the same tools and daily practices I’ve used to create a life than aligns with everything I value most. It’s currently free, it takes just 15 minutes a day, and if your intention is anything like mine, maybe the universe will bring you a dolphin. Visit Gateway Developments. Footnote: Both of my consulting clients eventually offering me contracts under their new ownerships. I accepted one – the one that provided the most freedom and flexibility, so I could focus on a life with purpose and porpoises. And How it Took me seven years to get clear on what I value Most. Seven year’s ago while on vacation, I started reading a book recommended to me called The China Study. The book’s author, T. Colin Campbell, PhD, advocated a “whole foods plant-based diet”. Thankfully when I bought the book, I had no idea what that meant. Plagued with digestive issues since I was a toddler, I had been on a life long pursuit for a diet that my body would tolerate. My search started long before holistic medicine became popular and conventional medicine was way out of the nutrition loop. I tried eating for my blood type, a buffet of high protein diets, and even a diet that suggested combining certain foods would make me feel and look like Suzanne Somers. After years of trial and error, I settled on a healthy diet of veggies, lean meat with limited dairy and processed foods. I still battled with some digestion issues, but figured this was as good as it was going to get. As I delved into the China Study, Dr. Campbell suggested a diet made up of whole plant based foods would prevent, reverse and cure just about every major health problem afflicting our North American culture. It all sounded like a simple solution, but really, could I see my self rock’n the vegan lifestyle? I was a marketing director for a large shopping centre, not a Birkenstock wearing hipster. In the final chapter of the China Study, the author challenged readers to eliminate all animal protein for just 30 days – a month of eating veggies, beans, whole grains, fruit and tofu. It also meant a month of no dairy, no eggs, no chicken, no fish, no beef, no animal protein of any kind. Having subjected myself to just about every other diet, I knew I could do it for 30 days. I went to the grocery store and stocked up on organic leafy greens, beans, tofurkey, veggie burgers, almond milk and a slew of other faux meat products to aid in the transition from omnivore to herbivore. Shopping the small health food section, I found products I didn’t know existed like nutritional yeast that when combined with other key ingredients could make a mean mac & cheese without the cheese. As I piled all my new found faux meats in the fridge, I eyed the left over roasted chicken and decided I would start my vegan diet the next day. But as I started hoeing into what felt like my last supper, the chicken wasn’t going down so well. The metamorphosis had already begun. I took my plate back to the kitchen, left the chicken for my husband and heated up some Amy’s organic lentil soup. Within four days of eating a vegan diet, my colon was doing the happy dance. No more chronic bloating, gripping abdominal muscle spasms, and constipation that would send me to the emergency room for an enema. On top of that, I was feeling lighter and sleeping better. I was so ecstatic with this drastic improvement, I started shouting my new found veganism from the the rooftop. If this diet made me feel better than ever, then it could do the same for my family and friends…right?!! I quickly retreated and learned to keep my veggie mouth shut. If asked about my diet, I used my standard elevator pitch, “I eat a vegan diet for personal health reasons. It happens to work for me. It’s not for everyone. ” It was safe, didn’t make anyone uncomfortable, and kept us on the dinner party circuit with our friends. I’m not the perfect vegan and I’m not sure if there is such a thing. I live with an omnivore, most of my friends and family are omnivores and a few close friends even farm and hunt animals. My friends will tell you I’ve been thrown off my vegan high horse more than once. I’ve had a life long love affair with pizza, and while I have found satisfying vegan options, once in awhile I indulge in the real thing with my friends at our favourite wood-oven-fired pizzeria. Our cottage is in Pictou County, home to the Lobster Festival where at the end of the season, fishermen race their boats down the harbour as we dip our lobster in warm melted butter. And while my fox hunting club may be faux (no animals are harmed), the meals served at the end of an afternoon of chasing hounds on horseback are filled with tempting homemade dishes enough to make any vegan go rogue for at least one meal. My vegan diet might have been motivated for health reasons, but in the search for nutritional information and recipes it was impossible to ignore the ethical and environmental arguments made for a plant based diet. A plethora of animal cruelty videos and documentaries on the effects of industrialized farming flood the internet and are enough to have any compassionate human question their food sources. 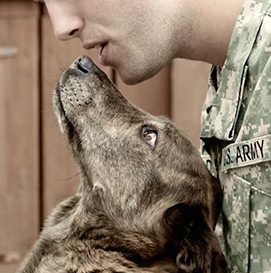 I have been drawn to everything four-legged and furry for as long as I can remember. No dolls for this girl. My room was filled with plush animals that were tucked into bed with me every night. Years later, I filled my home with the real thing and created a life where I am surrounded by animals and other humans who love them. 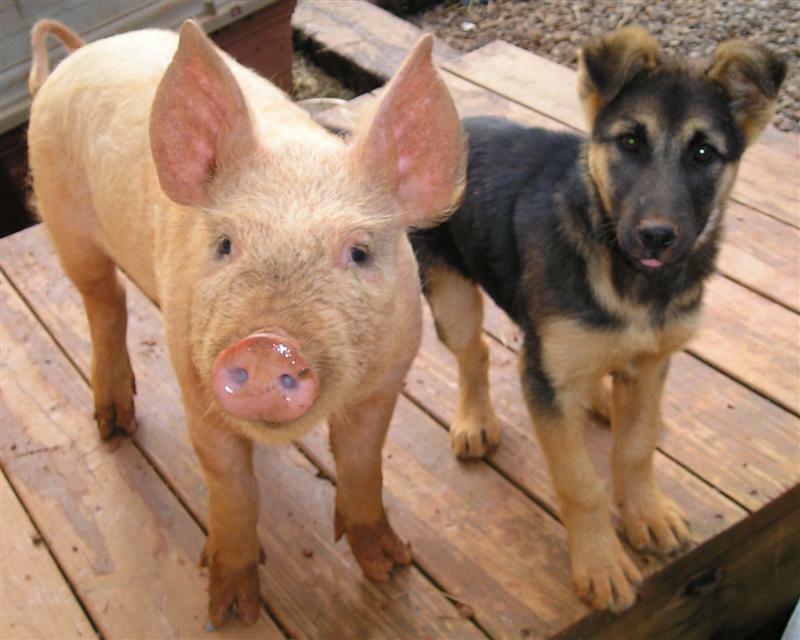 So, if I loved animals so much, why didn’t I consider a vegan diet years ago? Like most of us, I was completely disconnected from the meat sources that were presented in my grocery store to the reality of how they got there. I would rescue injured squirrels and birds, condemn those who would take a shotgun into the forest to hunt deer, gasp with disbelief at animal cruelty stories in the news, all while filling my freezer with neatly packaged chicken, beef and fish. The food industry made it effortless for me to disconnect the pets and wildlife I admired to the animals who are bred and killed for food. I’ve made that connection now and while I still don’t have Birkenstocks in my closet, I have traded in my mall career for one where I am closer to nature and the animals that feed my soul. I’m still enjoying the health benefits of a vegan diet, but my motive has shifted and now my food choices consciously align with my value to respect and have compassion for all animals, beyond the ones I share my home with. This year, my intention is to honour that value beyond my diet, and be more conscious of how all my actions can contribute to a sustainable planet that respects all beings. It might mean giving up a few of my favourite conveniences and making some tough choices, but if there is anything I’ve learned from this experience it’s that by connecting my heart to all of actions, I can live up to what I believe in most. The good news is, it doesn’t need to take you seven years to get clear on what you truly believe in. As you move into 2017, think about your own personal values. Once you clearly define them, you’ll move from a place of reaction to self-direction. You’ll focus on what is most important to you and your actions will reflect what your heart truly desires. One of the most enjoyable things about our long Nova Scotia winters is watching the snow fall from the comfort of our homes preferably in front of a crackling fire. But before you get too comfy and settle in for a long winter of hibernation, Koko and I have a few good reasons why we all should embrace winter, throw on our boots, and head out for a snow covered hike. Our winters are far too long to spend away from nature and all of the physical and mental benefits it has to offer. You’ll burn lots of calories and can reward yourself guilt-free with your favourite hot sugary beverage. It is beautiful. The sun is lower in the sky and when it glistens off the snow, it is breathtaking. It is the one season the trails are completely bug free! Before you hit the trails though, we have five tips to ensure you and your pooch have a safe and enjoyable hike. Please remember to always consider your dog’s age and heath when taking part in any physical activity. 1) Find a dog friendly trail – Always go where dogs are welcome. Look for trails where people have cross country skied and beaten down the trail, so your dog isn’t sinking chest deep in the white stuff. Until you are familiar with the terrain, keep your dog on a leash. Partially frozen lakes, icy trails and deep snow are all potentially hidden dangers in winter months. 2) Shorten your hike – Because your dog is working harder and burning more calories when moving through snow, consider shortening the duration of your hikes. Throughout the winter, they can build endurance and work up to longer treks. 3) Take frequent breaks – Most dogs don’t know when they’re getting too much of a good thing, so take frequent breaks and allow them to catch their breath. It’s also a perfect time to check for snow build up between their toes and re-hydrate them with a drink of water. 4) Gear up – Many dog breeds are well equipped to handle cold Canadian winters and have incredibly efficient built-in paw warmers that keep their toes toasty. Other dogs with thinner and shorter coats may need a bit of help. Investing in a dog jacket and even booties might make your dog’s outdoor winter adventures more enjoyable and fashionable! Don’t forget to bundle yourself up, preferable in layers that you can easily shed if you get too warm. This dog walker doesn’t leave home without her “clamp-ons”, studded attachments that fit on to your boots and provide grip on icy trails. Highly recommended to prevent bruised tail bones. 5) Apres Hike – Be sure you give your dog’s paws a good cleaning after your hike, especially if you’ve traveled over salt covered ground. And finally when you’re back home, curl up with your pup for a well deserved nap. 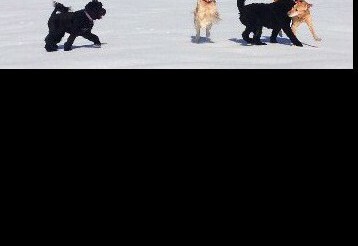 Last year, a friend gave me a bumper sticker that read, “Live Life Off Leash”. I thought what a perfect mantra. For me, it means putting fear and worry on the back burner, so I can get on with doing the things I love and leading the life I want to live. Sometimes that means making decisions that may be scary to take action on, but knowing in the end that action will get me closer to the life I want to have. 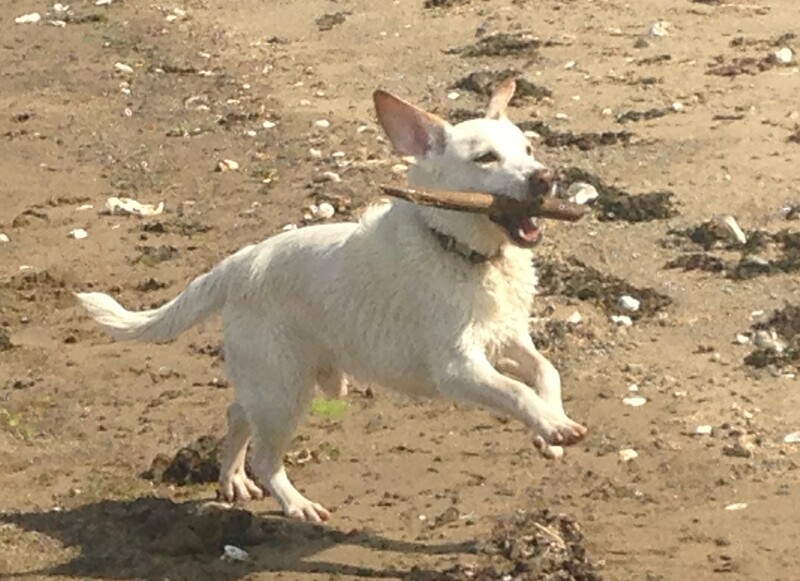 Our Charlie Dog took the “Live Life Off Leash” metaphor more literally. Many days we started our hikes together only for me to be walking home alone because he had found a scent that deserved further exploration. There have been a few times over the years when I have counted on the kindness of friends and strangers to help get Charlie back to me. Most of the time though it just required some patience on my part until he trotted out of the woods wearing a sheepish look on his face. Each time, I would tell him, “That’s it! No more off leash adventures for you!”…and then a week would go by and I would ask myself why was I projecting the fears I managed so well in my own life onto his. He deserved to live life off leash too. A month ago today, Charlie went on one of his adventures just five minutes from home. This time he didn’t return to us. I have spent the month filled with worry, grief and guilt. In between the searching and praying for his safe return, my mind kept returning to the “what if’s” and “Why didn’t I’s” – Why didn’t I just keep Charlie on a leash. We adopted Charlie from the Truro SPCA 11 years ago after the loss of our first two dogs just months prior. I had been searching on Petfinder for the next four-legged love of our life when I came across a nine-month old beagle/lab mix at the Truro SPCA. We brought Charlie home three days later on the heals of the most massive snow storm to ever hit Nova Scotia. We spent our first month getting to know each other playing snowball catch. He was a timid, but affectionate, little guy who would often welcome visitors by unintentionally taking a nervous induced piddle on their feet. It wasn’t until years later when the two of us took up hiking did Charlie grow out of his timid tendencies. As he got better at sniffing out squirrels and manoeuvring at high speeds through brush and fallen trees, his confidence grew off the trail. His nervous accidents all but disappeared and he began greeting strangers with a wagging tail. 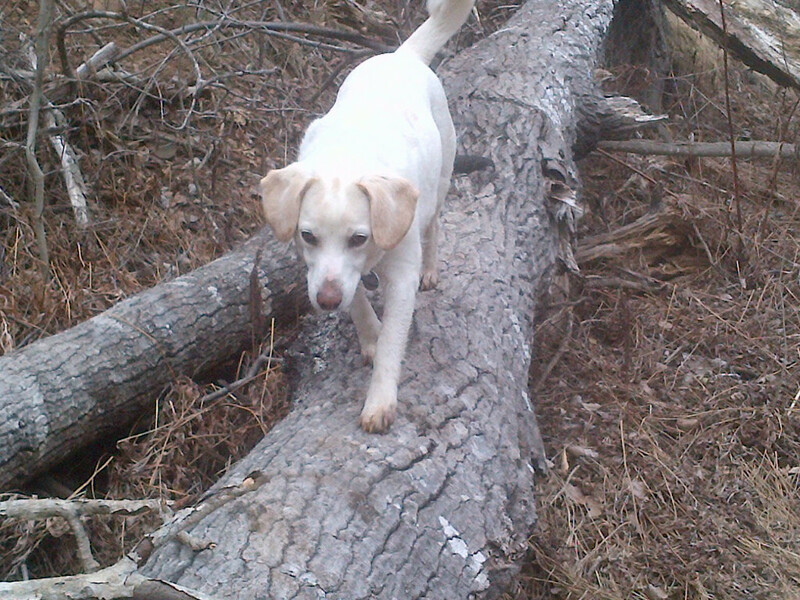 His off leash adventures transformed him into a confident little man. As much as it breaks my heart that Charlie is not with us today, it fills my heart that he enjoyed the same freedom and sense of adventure I value so much. All dogs are special and for me Charlie was my inspiration for creating a life off leash – one that provided a livelihood where I could spend my days with him by my side in the countryside and in the community I love. He may not be by my side today, but he is always with me. The best way I can honour Charlie now is to embody the same qualities I loved in him – his sense of adventure, his strength, his gentle way, his trust in others and his kindness – the same qualities we saw in so many of you who donated your time, resources and talents to help us try and find Charlie. What was a tragedy for Sean and me has also become a gift. The massive outpouring of help we received has opened our hearts and our eyes. It has given us a deeper connection and appreciation for each other, our family and friends, and our community. I’m grateful for this and grateful for the 11 years, almost to the day, we had with such an inspiring life-changing little dog. We will never stop looking for you, Charlie Dog. We all have our holiday traditions. For the Townsends, it’s opening our home to our God Dog, Reuben. 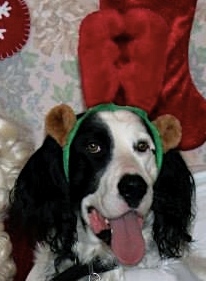 Reuben is a beautiful, well behaved English Setter, but a few indiscretions have almost landed him on the Naughty list. The most memorable Reuben holiday mishap was his attempt to make off with the Christmas turkey by discretely snatching it from the kitchen counter. For more stories, read our mpa winter newsletter 2014. 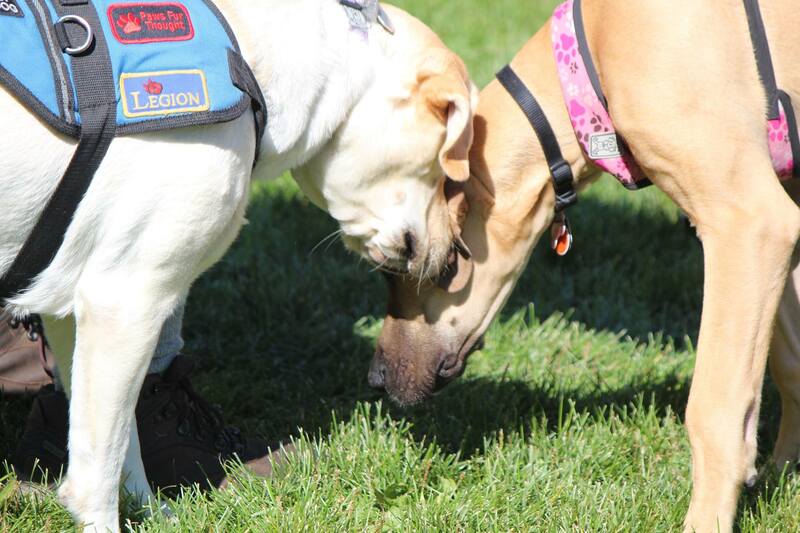 On Saturday September 27th, humans and hounds alike will hit the trails of Mt. Uniacke Estate Museum Park in support of canine rescue and veterans battling PTSD. Presented by Muddy Paws Adventures, Trails N’ Tails is a 45 or 90 minute nature hike (participant’s choice) through some of Hants County’s most picturesque trails. Participants will have the option to make a donation or collect pledges with all proceeds going directly to Paws Fur Thought and Atlantic Small Dog Rescue.